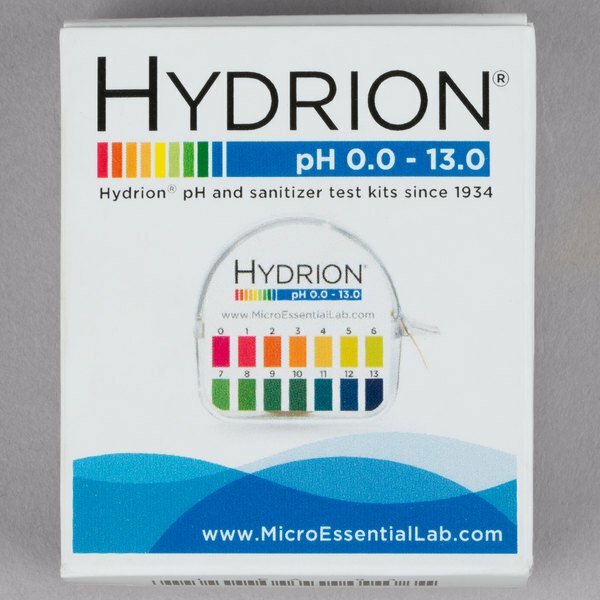 Designed for general purpose testing, Hydrion 93 S/R Insta-Check pH paper offers quick and easy pH level testing. You might be busy running your business, but you can't forget to monitor the safety of your utilities. With this pH test paper dispenser, you can monitor water quality with ease! You receive a 15 ft. strip of specialty pH paper, as well as a color chart to match the paper to after testing. 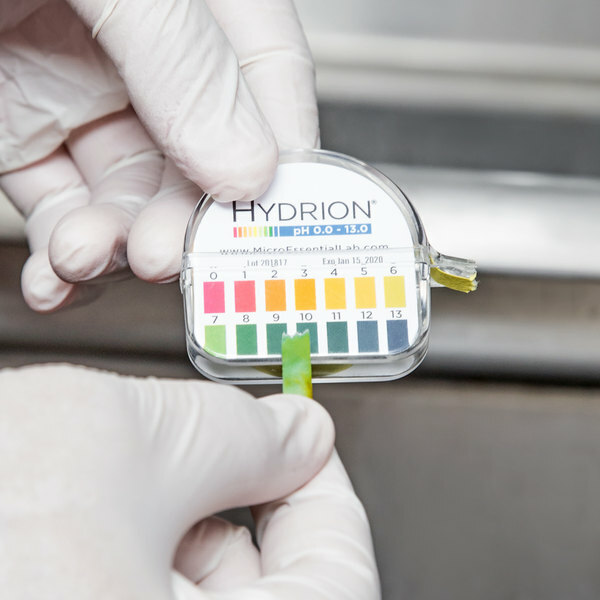 The paper's color corresponds to a pH level for a simple, visual testing method that the health department will be pleased to see. 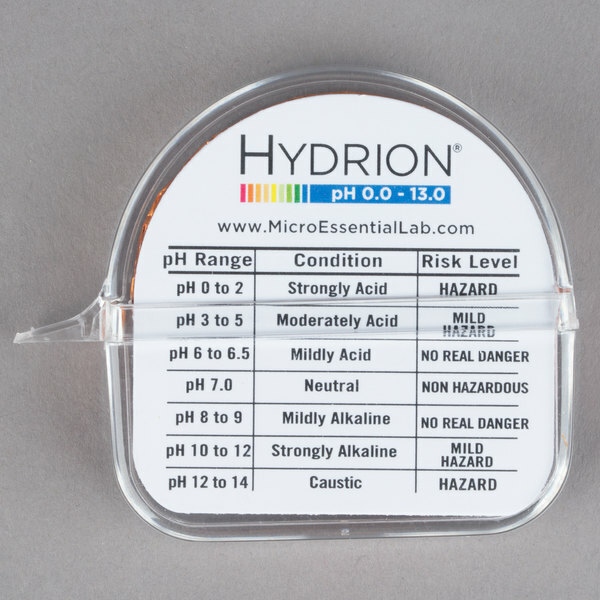 "These work great for testing the pH in the water for the health department! Our health department was happy to see we had on hand and it match her reading precisely!" 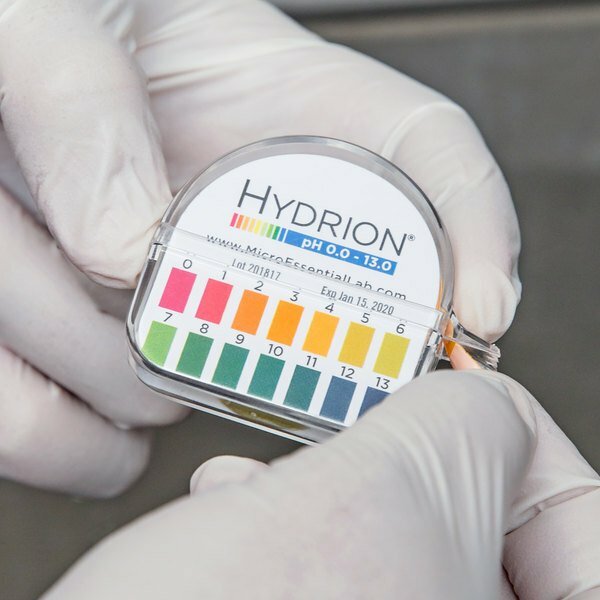 These paper strips have a distinct color match at each full pH unit, making it easy for the user to identify the correct pH level. 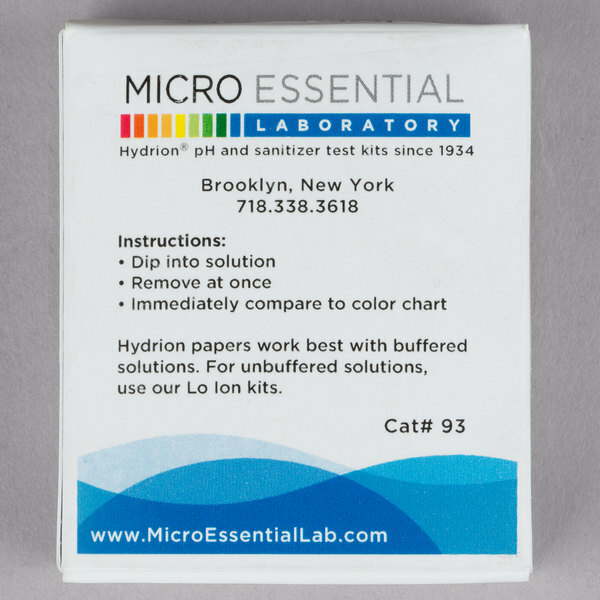 Simply tear off a small strip of pH paper, dip into the test solution, then instantly compare the resulting color with the matching pH color chart. For convenience and efficiency, the paper comes in a plastic dispensing container. The container holds (1) 15 ft. roll of paper, giving you plenty of use out of a single roll. It provides for approximately 200 tests. 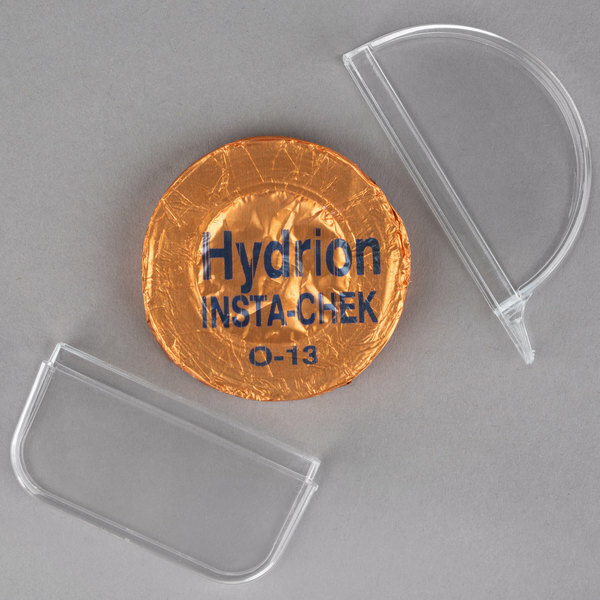 Hydrion Insta-Check offers the widest test range available in a single paper, with level 0.0-13.0 testing. This general use paper can be used for a variety of applications, including: Food Service, Industrial Testing, Safety Testing, Emergency Testing, Agricultural Testing, Classroom Demonstrations, and Hospital and General Laboratories. The distinct color chart and accurate, reproducible readings give an immediate response for quick and easy use. This makes it great for businesses that don't have all day to test their water. This is a very useful item for me personally. 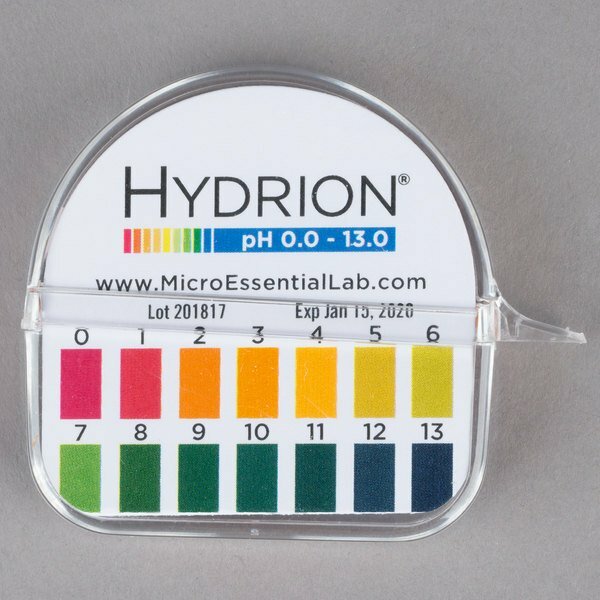 I like to keep my ph level at the optimum and this is the way to go. It is easy and gives instant results. Keep healthy. I am using this test paper to test the pH level of my lotion batches. It gives me peace of mind to know that I am within range on my products. This pH paper is excellent quality, and accurate. Same brand of pH paper as used in academic laboratories. A good deal and convenient. Thanks Webstaurantstore. i use these test strip roll everytime i drink water to make sure that it is clean and good to drink! good price as well! The tape is fast, compact, economical, and includes every thing you need. I tested them out on some water with baking soda in it, and it read correctly, so they seem accurate enough for most uses. Excellent product and easy to keep on hand. First off it's really a lot smaller than I thought it would be, but it's easy to carry on hand. Second it's well made and very easy to pull a strip out to test things. I use it to make sure the municipalities are neutral so it doesn't kill my plants. Also an added bonus I use it to monitor my health. Cheaper price to buy it here than other online retailers. We will likely add this item every time we order other stuffs, since it won't add additional shipping. However, it is not cost-efficient if just ordering this item (with added shipping). These work great for testing the pH in the water for the health department! Our health department was happy to see we had on hand and it match her reading precisely! My daughter needed these for a science project. I didn't think I could find these anywhere, thank goodness for Webstaurant Store, this was exactly what she needed. This is a great product if you don't need an exact pH level. It is very economical and has provided us about 100 uses. It does only give you the pH to full units, so I wouldn't recommend it if you need to distinguish more than that. 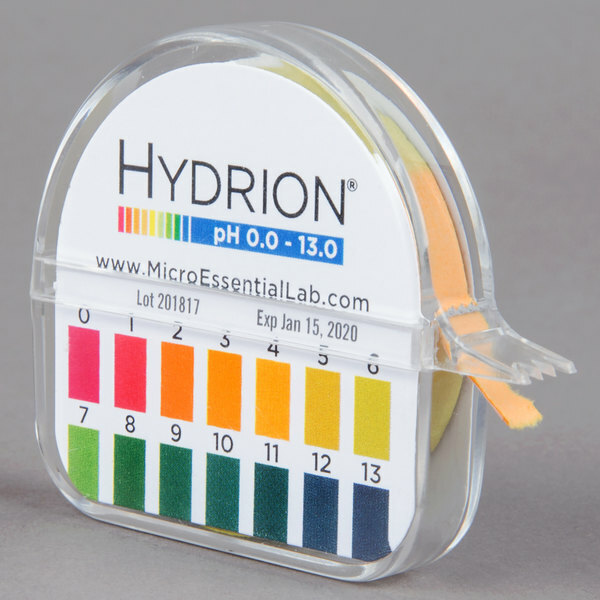 Easy to use with color match chart on the front to ensure you're at safe pH levels. Check your local health department as this is now becoming the only acceptable "instant" test strips they allow for use now! This strip is good for testing basic acidic things maybe. But I tested water and found it showing the same color as baking soda water. Meh. I used thisHydrion 93 S/R Insta-Check pH Test Paper Dispenser - Level 0-13, for check the ph level in the Pool or in the water for mix with some Chemical. it's work very good and the price is reasonable. These work extremely well and can be used for a wide variety of things. I can see how these would be important in a commercial setting, but I've mostly been using mine to check the pH of skincare products I've been using. Everything seems to be accurate. Good price too! We purchased this product as part of a requirement for our food truck inspection. The directions are listed on the back, which I like as I would have had no idea how to use them. I couldn't find any pH test kits locally that had the range that I needed. Plenty of pool and hot tub kits but they don't have the range I needed. I use to test the acidity of things by dipping my finger into it and seeing if it burned. Primitive, yes, but what else was I supposed to do before I bought the Hydrion 93 S/R insta-check pH Test Paper Dispenser? Now I can quickly (and most importantly harmlessly) check the pH levels. Fun and easy! We use these strips to test our sanitizer solution. The Board of Health requires these for testing and they work perfectly. Pricing is great and the quality is perfect for our needs.